Ten months of family business in New York had kept me away from the Conroe theatre scene for a very long time, so it was especially nice last Saturday evening to follow dinner with a dear friend at Joe’s Italian Restaurant (Oh, that divine tomato sauce!) by a visit to the latest Players Theatre Company production at the Owen Theatre. (Artistic Director, Joe Viser) Written by John Cariani and titled Almost, Maine, the play offered evidence that this must be my week to attend slightly offbeat shows. I had just finished reviewing a cute and “edgy” one-woman musical titled, In Search of Johnny Depp, at the TUTS Underground in downtown Houston’s Hobby Center. (See review at www.ThePeoplesCritic.com). Both of these shows served up generous portions of the unexpected, with side orders of both humor and pathos. 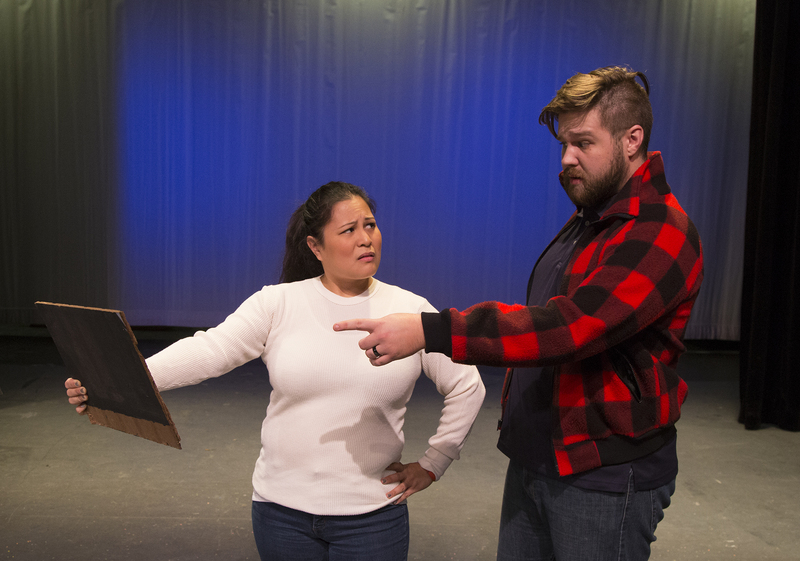 Almost, Maine could be mistaken for a theater workshop class with its series of eight little vignettes, each with only two or three players from among the cast of twenty-one. In his program notes, director, Don Hampton, describes the show’s primary theme as “the irrationality, sheer joy, and sometimes heartbreak of LOVE.” The love theme seemed timely with the approach of Valentine’s Day, and the house even offered attending couples the opportunity to be photographed against a valentine backdrop in the theater’s lobby. And even before the show began, a series of love-related quotations and sayings were being slowly projected on the stage. Lines like, “True love stories never have endings,” and “If love is blind, why is lingerie so popular?” come quickly to mind. It was a nice way to settle the nearly full-house audience before ShowTime. The scenes all take place in frozen northeastern Maine under a very starry sky, (Lighting, Tony Knepper). Everyone is bundled up against the cold, while cottony snow and frost border the stage and simple set pieces. The sketches were loosely linked by a Prologue, Interlogue & Epilogue featuring Jody and Amy Nabors in short scenes amusingly demonstrating that when you are right next to someone, you are also as faraway from them as you can be because the world is round. Speaking of being faraway, those of us seated in the last rows would have occasionally appreciated stronger vocal projection from some in the cast. When the show really gets underway, the first scene features, Katt Gilcrease and Shelby Escamilla in “Her Heart,” the sweet short tale of a gal who has traveled to icy Maine in hopes of seeing the Northern Lights. After my nice Intermission cup of hot coffee in the theater’s cozy lobby, Act II opened with a kooky but endearing first scene titled, “They Fell.” Landon Edwards and Drew Schultz cleverly portray two rugged young Mainers who have been rejected in love by the ladies. But they find consolation in being really good buddies to one another. The comic timing here is terrific, and the results are pretty hilarious. I’ll leave it at that. Scene 2 is called “Where It Went,” in which an ice skating couple (Bill Giffen & Bre Jatzlau) is confounded by the disappearance of a shoe during their skating. Expect a surprise when the next shoe drops in that sketch. Scene 3, “The Story of Hope,” features Margaret McDonald & Mr. Jeter as it depicts the return of a girl searching to find the old beau who once asked her to marry him. The long gaps and tedious pacing in this scene made one look forward to the brisk and focused activity of the talented stage crew that efficiently shifted scenery during each set change. In the final scene, “Seeing the Thing,” there is a slow start with Miss De Los Santos playing a shyly inexperienced girl frightened by the affectionate advances of Hunter McMahon. But as the scene progresses it becomes one of the most delightfully hilarious segments in the show. If that’s not temptation enough to attend, consider this. There is a strip scene that beats anything Gypsy Rose Lee ever tried, and it is not X-Rated. You can safely bring the whole family! 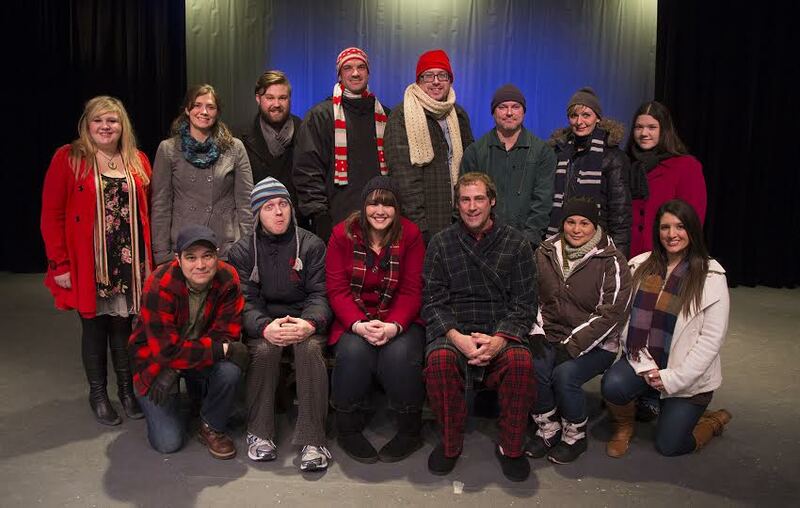 ALMOST, MAINE continues through February 15th at The Owen Theatre, 225 Metcalf Street in Conroe. 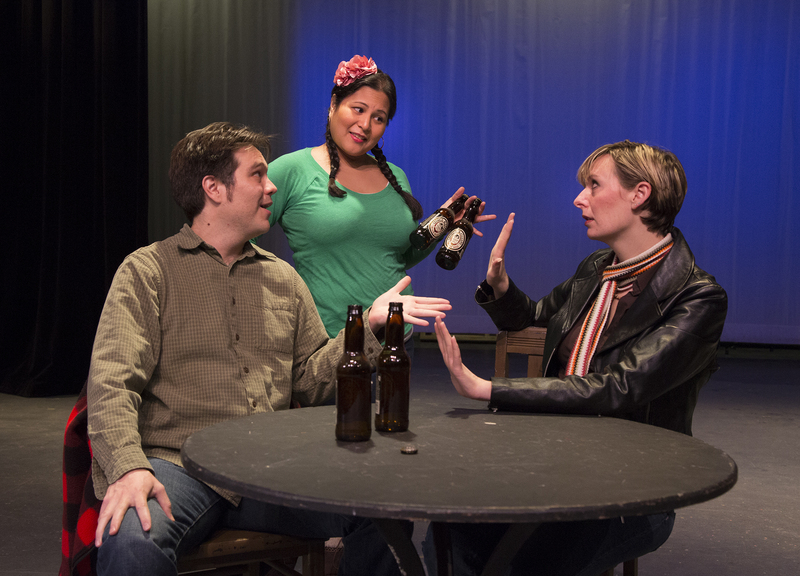 Performances are Fridays and Saturdays at 8pm with 2pm Sunday matiness on February 8th & 15th. Tickets are $22 or less, depending on group or age discounts. For information visit the website at www.owentheatre.com or call 936-539-4090. This entry was posted in Almost Maine, BroadwayStars.com, Conroe Courier, Houston Community Newspapers online, Off Broadway, Owen Theatre, The Courier Columns, The Players Theatre Company, The TICKET, Theater Reviews, ThePeoplesCritic.com and tagged Almost Maine, Conroe, Owen Theatre, The PLAYERS Theatre Company. Bookmark the permalink. Your writing has taken a strong up-tick! Keep up the good work ! A great review. Critique and encouragement balanced again! How fortunate your students were to have you as a teacher. Looking forward to Saturday night Mardi Gras celebration.